Are you looking for a delicious seafood recipe with a difference? If you are, you’ve found it! 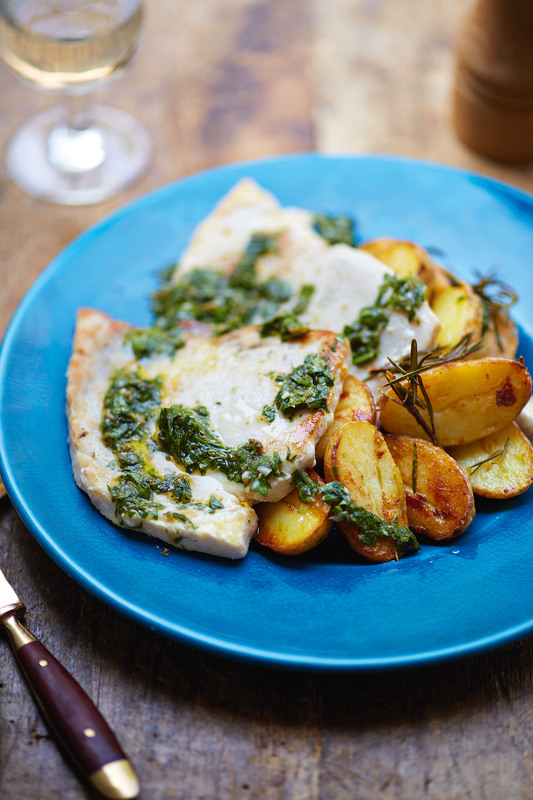 Here’s my swordfish steaks & sautéed potatoes with gremolata for you to enjoy. 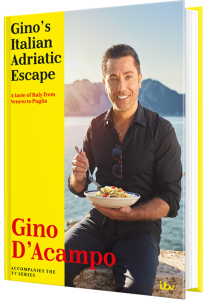 I cooked this dish overlooking the beach at Pescoluse, on the Puglian coast. It’s known as the Maldives of Salento and is a hidden paradise. I used swordfish, but tuna would work well too. Gremolata is a dressing of raw chopped garlic, parsley and lemon zest. It is usually sprinkled over meats, such as osso bucco or carpaccio, but it also makes a great garnish for grilled fish. Always make sure you buy swordfish from a sustainable source, from fisheries that have been certified by the Marine Stewardship Council (MSC). 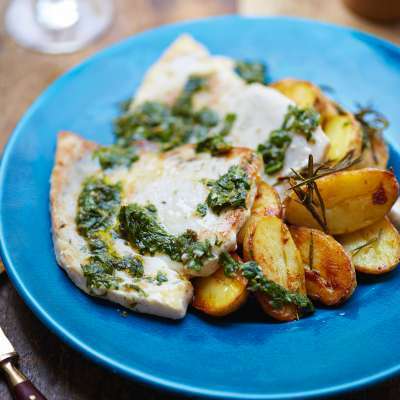 Feast your eyes on the finest swordfish steaks & sautéed potatoes with gremolata! It’s straightforward and fun to make this great dish. Simply follow the instructions below and get the perfect result. Bring a large pan of salted water to the boil and cook the potatoes for about 7 minutes then drain. When the potatoes are cool enough to handle, slice in half lengthways. Meanwhile, make the gremolata. Put the parsley, garlic, capers and lemon juice and zest in a medium bowl. Pour in the oil and stir to combine. The mixture should have the texture of a wet pesto. Season with salt. Set aside. Heat 90ml of the oil in a large, high-sided frying pan or sauté pan over a medium to high heat. When very hot, add half the potatoes, cut-side down. Fry for about 1 minute then add the rosemary and 4 of the garlic cloves. Fry then potatoes for about 5 minutes each side or until golden and crisp. Transfer to kitchen paper to drain. Repeat with the remaining potatoes, topping up with more oil if needed. Keep warm. Meanwhile, heat the remaining 90ml of the oil in a large, non-stick frying pan over a high heat. When hot, add the remaining 2 garlic cloves. Gently lay the swordfish steaks in the pan and fry for 2 minutes each side, or until the fish is just cooked through. Season with salt. Divide the potatoes among 4 serving plates and place the swordfish alongside. Drizzle over the gremolata. Once you’re done, simply sit back and enjoy your swordfish steaks & sautéed potatoes with gremolata and don’t forget to check out other great authentic Italian recipes including great antipasti recipes, Italian pasta recipes, Italian soup recipes, Italian beef dishes and authentic pizza recipes.